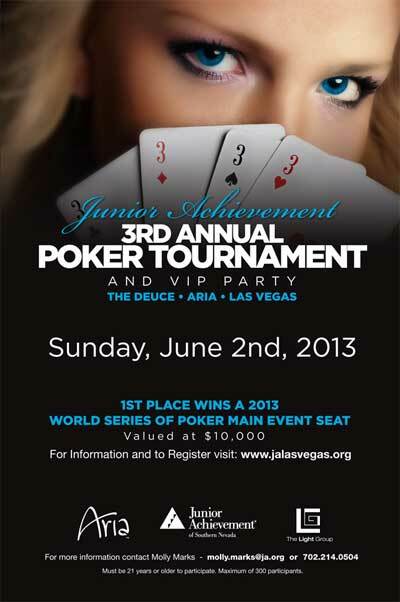 Tournament registration is now open at www.jalasvegas.org. Participant buy-in is $250 per person with the grand prize being a seat in the 2013 World Series of Poker Main Event (valued at $10,000). Cash prizes will also be awarded for second, third, fourth and a fifth place finishes. Space is limited and all net proceeds, including admission, table sales and buy-ins will be donated directly to Junior Achievement of Southern Nevada. Spectator passes are available for purchase for $100 ($150 at the door). Hosted in Aria’s The Duece Lounge, the weekend affair promises to be a good time for participants and spectators alike. The lounge environment lends itself to socializing, quality entertainment and having a great time. Junior Achievement aims to create not just a poker tournament, but a memorable party experience. Music will entertain guests and generous food and drink will be offered throughout the event. A local poker personality will act as tournament commentator, announcing “Shuffle Up and Deal,” promptly at noon. Additionally, attendees can use their mobile devices to peruse and bid on several dozen silent auction items through phone-based, silent auction platform – Auctions by Cellular. The annual affair has a history of attracting some of poker’s brightest stars, including past WSOP bracelet winners Bobby Baldwin and Phil Hellmuth in 2012. Last year’s event raised more than $100,000; money that all went toward Junior Achievement’s mission of inspiring and preparing young people to succeed in a global economy. This year, JA aims to raise $150,000 to support their many programs across Clark County.